My larger than normal guest room. 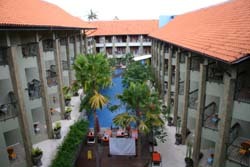 The All Seasons is a relatively new hotel in the inner bowels of Legian. Like most of Accor group's newer hotels throughout Indonesia, the hotel's design features a somewhat retro 70's feel, with clean lines and splashes of bold earth tones. Rooms are arranged around a central courtyard holding the swimming pool. My third floor room is right in the middle of the "short" side, with a nice view of the pool from the large balcony. This specific room was a bit larger than the others, and featured clean modern lines using glass, wood and steel. The room was tiled rather than carpeted, but it's entirely appropriate for a tropical beach resort. There was a small refrigerator, but it was not stocked, which I thought was a good thing. There are plenty of nearby mini-markets where you can purchase whatever you want to drink and stock the refrigerator at a small fraction of normal hotel prices. Hotel facilities include swimming pool, spa, restaurant and a pool-side bar. 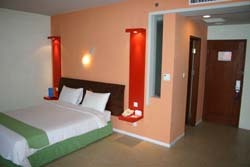 Rooms feature air conditioning, hot and cold water, refrigerator, complementary coffee and tea, color televisions (many channels) and telephones. Pluses: Good location, near restaurants and shopping. Minuses: No elevators, making it a bit of a hike to third floor rooms with luggage. Rooms at the All Seasons Hotel may be booked through Agoda, or use Hotels Combined to compare rates for the resort from dozens of online booking sites.